Nice view! Perfect skyline as you start to think about dinner! Nozawa Onsen...why would a town be named as if it were a hot spring? I’d vaguely heard about the place many years ago, but frankly hadn’t paid much attention. 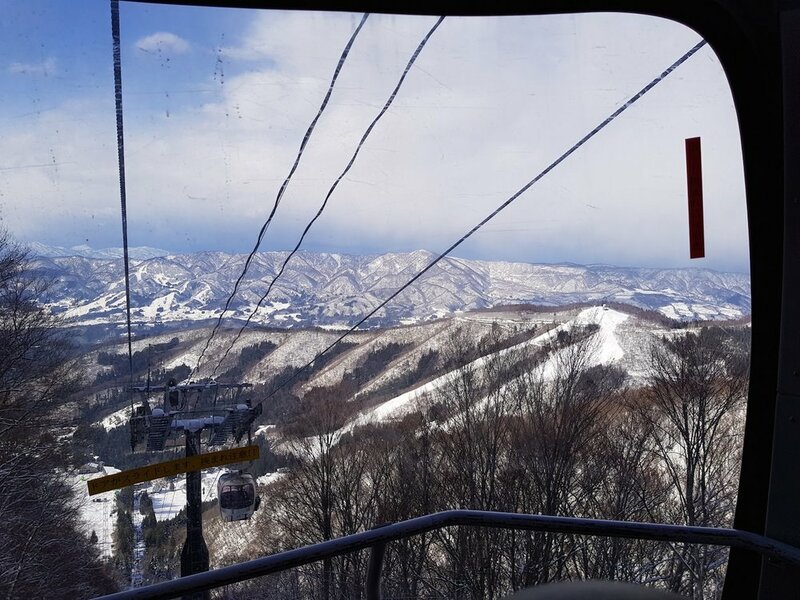 When my husband started looking for a place to ski in Japan that wasn’t yet booked out, Nozawa seemed like a winner due to its small size and proximity to Tokyo. We spent one week there with our young family in early December, 2018. Your perfect ‘onsen tamago’ (soft-boiled egg) is ready in 22 minutes using local hot spring water! If you’re looking for bars and a sake-infused nightlife, Nozawa Onsen might not suit. It’s a quiet little village on the side of a steep mountain that appears at time reluctantly waking up to outside interest. In fact, I’ve never seen so many Aussies in one place! Not that the locals are unfriendly, in fact most are delighted if you can muster up the courage to say ‘konnichiwa’ (hello). One charming aspect about this town is the large number of public baths dotted around. Located about ten minutes apart, they run on a community caretaker system and are free of charge. Having spent some 25 years in and out of Japan, I consider myself an ‘onsen’ fan and was keen to try them out. Cold Japanese winters have never been my favourite thing, but I do love the traditional custom of visiting the bathhouse to warm up (and sometimes socialise!). If you’re a bit shy, you could try the Nozawa Onsen Spa Arena, which allows people to bathe in their swimsuits at the outside onsen. You can come along hands-free and just hire a set of togs. If you’re not too large, that is. I was kind of pushing the aunty size category at an Australian size 14. There’s a cafeteria there too, so you could easily spend a few hours just relaxing in the heated environment. Just a few tips on bathhouse etiquette…just copy everyone else around you and you’ll be right. After a couple of days, I decided to venture beyond the onsen in my B&B and try some of these bathhouses. After getting into my birthday suit, I was a bit surprised to be hit by the blast of cold air inside the bath house. Unlike public baths that I’ve been to in the city, there was no heating to be found. Also, the only water coming out of the taps to ‘pre-wash’ our bodies was the temperature of melted ice. Even if you can’t read Japanese, you’ll soon work out which is ‘hot’ and which is ‘blood* hot”. With my daughter was looking increasingly unhappy with this cultural experience, I did my best to wash both of us by mixing the scalding bath water with the tap water to make it more acceptable. Putting cold water in the communal bath is not the done thing though, so I ended up trying to place warm wet towels on her as the water was too hot for her initially. By the end of our trip though, she was amazingly able to get in most baths with me. I think she was motivated mummy-daughter time, and by the fact that it was the only family activity that she and I could do alone. And once you’re done with the bath, you might need some sake for the rest of your tired ski-worn muscles! Perhaps because it was so early in the season, there weren’t many places to eat at night-time. We found enough to get small restaurants to get by, although it meant we needed to plod down the mountain each evening. We made it a habit to eat early and carry small treats to entice our kids to walk back up the hill. The ski-in, ski-out location of our accommodation, Lodge Nakajima, was terrific for weary ski bunnies with the ski shuttle just up the road and a few yummy nearby cafes. I’d love to visit again, perhaps during a different season. I’m already eyeing off the Dosojin Fire Festival, held in…hey, January! Never mind, I still have a few more onsen out of the 13 in the area to check out! Some hints on making your stay at Nozawa Onsen ever better! • Catch Shinkansen to Iiyama station and then Nozawa Liner bus from bus stop #4 outside Iiyama train station (buy tickets at vending machine) to Nozowa central bus stop. Buy tickets for return trip inside the Nozawa bus terminal office at the vending machine. • A free snow mobile service runs between Nakasaka gondola and Hikage gondola. • Loop shuttle bus leaves from Nozawa central bus stop to Nakasaka gondola at top of village. • Winterland restaurant a great place for a casual meal of Chinese gyoza and beers with a small children's play area. • Snow monkey day trip is popular but wear proper footwear as some nearby construction is making the area muddy. • If staying in village can use the Yu-Road moving walk travelator to reach Hikage Station gondola. If it is in operation at the time of your stay!